The Geo. 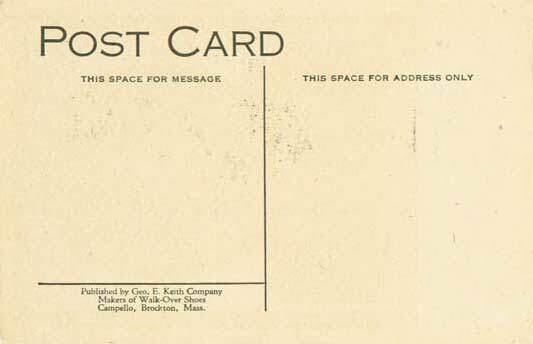 E. Keith Company, a maker of fine shoes located in the Campello section of Brockton, Massachusetts, published a series of postcards of famous Americans some time in the 20th century. 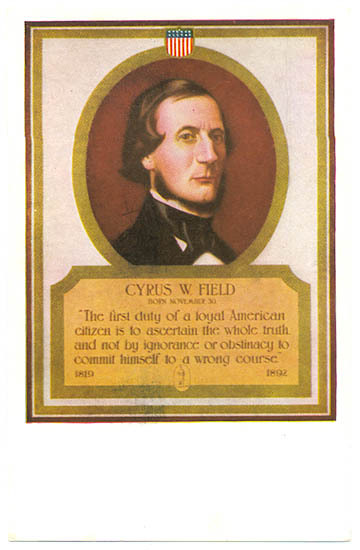 Shown on the left is their card for Cyrus W. Field. On the right is a 12" x 10" stand-up counter card with a somewhat more elaborate presentation of the same image. 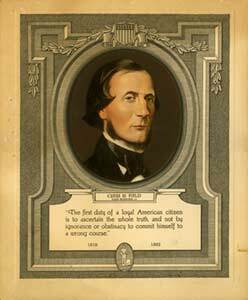 "The first duty of a loyal American citizen is to ascertain the whole truth, and not by ignorance or obstinacy to commit himself to a wrong course." I cannot find a source for this quotation. 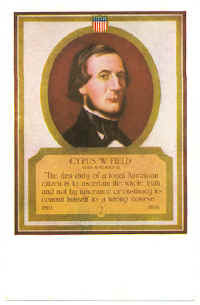 While Field was a prolific letter-writer, he had no published works. Other cards in the same series featured William Cullen Bryan, Theodore Roosevelt, Mark Twain. "Half a century ago a man of high ideals, far-seeing vision, and rare courage dedicated his life to the work of making shoes fit better. That man was George E. Keith, and his life work became an American institution, for George E. Keith created Walk-Over." The Keith company is still in business in Brockton, MA.